Direct disease modeling could lead to customized treatments for individual patients based on their own genetic and cellular information. Difficult-to-study diseases such as Alzheimer's, schizophrenia, and autism now can be probed more safely and effectively thanks to an innovative new method for obtaining mature brain cells called neurons from reprogrammed skin cells. "the most exciting part of this research is that it offers the promise of direct disease modeling, allowing for the creation, in a Petri dish, of mature human neurons that behave a lot like neurons that grow naturally in the human brain." Chen added that the method could lead to customized treatments for individual patients based on their own genetic and cellular information. The research will be published in the journal Stem Cell Research. "Obviously, we don't want to remove someone's brain cells to experiment on, so recreating the patient's brain cells in a Petri dish is the next best thing for research purposes and drug screening," Chen said. Chen explained that, in earlier work, scientists had found a way to reprogram skin cells from patients to become unspecialized or undifferentiated pluripotent stem cells (iPSCs). "A pluripotent stem cell is a kind of blank slate," Chen explained. "During development, such stem cells differentiate into many diverse, specialized cell types, such as a muscle cell, a brain cell, or a blood cell. So, after generating iPSCs from skin cells, researchers then can culture them to become brain cells, or neurons, which can be studied safely in a Petri dish." Now, in their new research, Chen and his team have found a way to differentiate iPSCs into mature human neurons much more effectively, generating cells that behave similarly to neurons in the brain. Chen explained that, in their natural environment, neurons are always found in close proximity to star-shaped cells called astrocytes, which are abundant in the brain and help neurons to function properly. "Because neurons are adjacent to astrocytes in the brain, we predicted that this direct physical contact might be an integral part of neuronal growth and health," Chen explained. 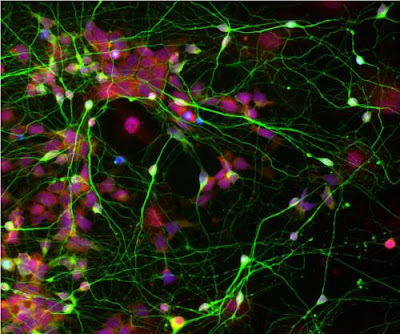 To test this hypothesis, Chen and his colleagues began by culturing iPSC-derived neural stem cells, which are stem cells that have the potential to become neurons. These cells were cultured on top of a one-cell-thick layer of astrocytes so that the two cell types were physically touching each other. "We found that these neural stem cells cultured on astrocytes differentiated into mature neurons much more effectively," Chen said, contrasting them with other neural stem cells that were cultured alone in a Petri dish. "It was almost as if the astrocytes were cheering the stem cells on, telling them what to do, and helping them fulfill their destiny to become neurons." To demonstrate the superiority of the neurons grown next to astrocytes, Chen and his co-authors used an electrophysiology recording technique to show that the cells grown on astrocytes had many more synaptic events—signals sent out from one nerve cell to the others. In another experiment, after growing the neural stem cells next to astrocytes for just one week, the researchers showed that the newly differentiated neurons start to fire action potentials—the rapid electrical excitation signal that occurs in all neurons in the brain. In a final test, the team members added human neural stem cells to a mixture with mouse neurons. "We found that, after just one week, there was a lot of 'cross-talk' between the mouse neurons and the human neurons," Chen said. He explained that "cross-talk" occurs when one neuron contacts its neighbors and releases a chemical called a neurotransmitter to modulate its neighbor's activity. "Previous researchers could only obtain brain cells from deceased patients who had suffered from diseases such as Alzheimer's, schizophrenia, and autism," Chen said. "Now, researchers can take skin cells from living patients—a safe and minimally invasive procedure—and convert them into brain cells that mimic the activity of the patient's own brain cells." Chen added that, by using this method, researchers also can figure out how a particular drug will affect a particular patient's own brain cells, without needing the patient to try the drug—eliminating the risk of serious side effects. "The patient can be his or her own guinea pig for the design of his or her own treatment, without having to be experimented on directly," Chen said.